This name, with variant spellings Semple, Sempill, Sample, Simpole, Sambals, Sambell(s) etc., is of French locational origin from any of the places names saint-Paul or from Saint-Pol in Pas de-Calais, Normandy. The surname is first recorded in England in the mid 12th Century, (see below). One, Symon Sempol appears in the 1271 "court Rolls of Abbey of Ramsey", Cambridgeshire, and a John Sampol in the 1351 "Register of the Freemen of York City". The substitution of the initial "B" for "P" i the second element of the name appears in the 16th Century. On December 6th 1558, George Samboll, an infant was christened inSt. Mary Abbots, Kensington, London. Richard Samble (1644 - 1680) was a travelling Quaker Minister who published religious works. The final "s" on the name indicates the patronymic and is a reduced form of "son of". 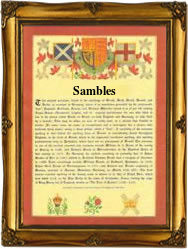 Sambals and Sambells are listed among the variants in London Church Registers of the mid 19th Century. The first recorded spelling of the family name is shown to be that of Robertus de Sancto Paulo, which was dated 1159 in the Pipe Rolls of Bedfordshire, during the reign of King Henry 11, known as the Builder of Churches, 1154 - 1189. Surnames became necessary when governments introduced personal taxation. In England this was known as Poll Tax. Throughout the centuries, surnames in every country have continued to "develop" often leading to astonishing variants of the original spelling.